This condo is perfectly located in the middle of downtown. Close to shopping, and dining. The condo is spacious and has a great kitchen. For being pet friendly, it is nice an clean. Perfect place for a weekend in Mammoth! We would like to thank these guys not only for staying with us, but for their service to you country!! "The home was filled with junior enlisted soldiers for the thanksgiving weekend and we enjoyed the House very much. It was more spacious than we had originally thought and extremely affordable. I highly recommend the house, you definitely get the mountains feel. Thank you for allowing us to stay, we thoroughly enjoyed our holiday visit. I appreciated how spacious the rooms were. It was roomier than it looked in the pictures. And the living room was so cute with plenty of seating to accommodate our crowd. I also appreciated all the little touches: plenty of clean towels, extra pillows, and a fully-stocked kitchen. We had a great time. Thanks! Thanks for being such an amazing host! The cabin we stayed in was amazing and the location was perfect. Cant wait to come back up again. Hello - We loved the Silver Bear #37 condo. By far it is the best one we have rented in Mammoth. The location was great. It was beautifully updated and very comfortable. The check-in process was really simple too. And we appreciated the flexibility with the late checkout request. It gave us a little extra time to pack up our things that last morning. We cannot wait to stay there again! Thank you . We love the unit and would love to stay again . We had a great time staying at unit 91. It felt like staying at our home away from home. Comfortably accommodated 7 of us. Very close to Canyon lodge, less than 5 minutes walk. The hot tub is right outside the door which was a great convenient way to soothe the muscles after a day on the slope. The kitchen was fully stocked and the linens were clean. Highly recommended. Had a fantastic time staying here, unit is exactly as pictured. A very warm and cozy condo with lots of open space. Loved that everything was labelled, as it took the guess work out of trying to figure out were things were. It was perfect for our family getaway. We were blessed with awesome weather and spent most of our time hitting the slopes. 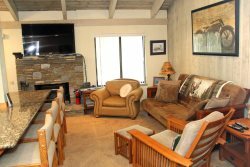 Unit is within walking distance to green shuttle which takes you directly to Eagle Lodge at Mammoth Mountain. Check in and check out process was a breeze. Only minor complaint was the WiFi was not working, which wasnt a big deal since main purpose was to spend quality family time. That and enjoying the awesome view and fresh powder falling down on us. Would definitely recommend staying here. Hi, we had a really nice time. The place was clean and very nice. The keys were ready when we got there and very easy to pick up and check in. Best part about the stay was the easy check in and check out process. We really enjoyed the place and would definitely stay there again for our next visit. Also, it is very close and easy to get to Eagle lodge. Very convenient. We truly enjoyed our stay at this condo. Over the years we have stayed at many different condos and this one stands out in the top. The unit was very nice, the kitchen equipped with quality pans and dishes, and the decorations were nice. When we plan another trip we will keep this unit in mind. If possible, please thank the family that owns this unit. They deserve praise. Unit 16 at Wild Flower Condos was amazing. The accommodations were perfect and the unit was well stocked with everything we needed to have an amazing vacation. Maybe one light bulb was out in the living room - but the pots and pans, washer dryer, shower, beds, linens, proximity to friends/jacuzzi/parking/trash - everything else as good as any unit in town. Very delighted! Check in check out - super easy. Everyone super firendly. Back at work and off to a dreadful meeting with visions of home base unit 16 dancing in my head. Everything was great! It truly was just a five minute walk up to the lifts. Location was amazing! Place was very clean and cute. Would definitely stay again. We had a great time and really enjoyed condo SR19. Your site manager was excellent. Thank you for having a great staff. We will definitely return. We enjoyed the trip so much. Location is great, close to bus stop and Vons. Its comfortable with all kitchen needs for 2 families. Hot water never run out:) I was worried when I booked. Thanks your staff for us! We had a fantastic time staying at this condo during the New Year. The remodel was lovely and the decor beautiful. We would like to rent this condo for our future trips to Mammoth. The reservationists that made the reservation for me was very helpful in reserving the condo for the New Year. Im glad I waited for her to call back. Thank you very much! Everything was fine in the condo, and the reservations and key pickup were seamless. It has ALWAYS been a pleasure every year we have stayed up in Mammoth going back to Wildflower, Woodlands and currently Snowflower. Our accommodations have always been exceptional and all staff are very pleasant. I would say that our stay at Snowflower is within walking distance to many amenities such as stores, restaurants, bike trails, parks and roads to the lakes. We thoroughly enjoyed our stay. We definitely plan to visit you again soon. Thank you again so much! Our stay at Sunrise #19 was everything we expected. We were more than satisfied with all the amenities the condo has to offer for the price. We will definitely stay next season!! !